The task of sorting through 12,000 photographs to provide the 600 included in this book was a true pleasure for me and a wonderful walk down memory lane. It allowed me to revisit the memories of my relationships with many employees and customers, as well as recall the extensive travel, thousands of jobs we have done and equipment we have manufactured and installed all over the world. 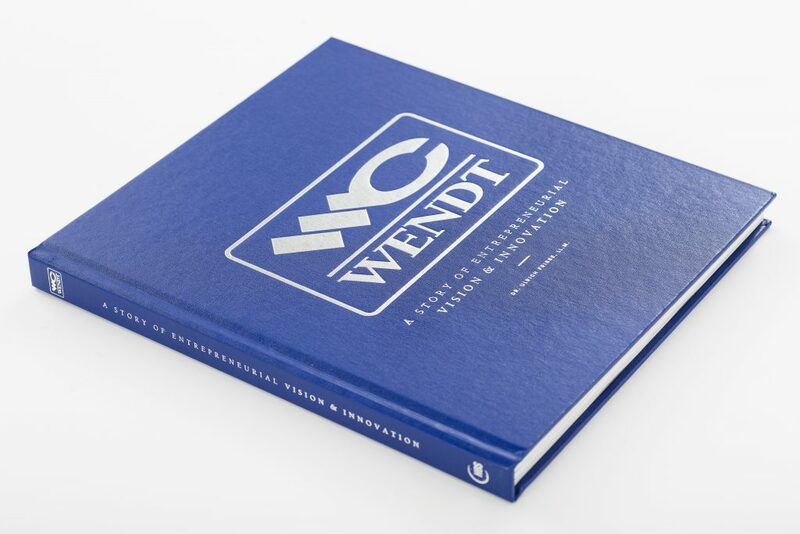 Our latest company history book, legacy book, and company anniversary book, Wendt: A Story of Entrepreneurship, Vision & Innovation tells the story of Buffalo, New York-based Wendt Corporation, an industry leading manufacturer of shredders and metal sorting systems of 40 years. In 1977, mechanical engineer Thomas Wendt decided to follow his entrepreneurial dream and, together with a team of dedicated employees, began building a manufacturing company dedicated to serving the North American metal processing industry. 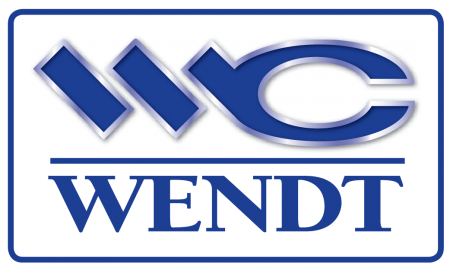 Today, under the joint leadership of two generations of Wendt family entrepreneurs, Wendt Corporation is a manufacturer of state-of-the-art heavy equipment that leads the industry through continuous innovation, advanced technology and proven performance. 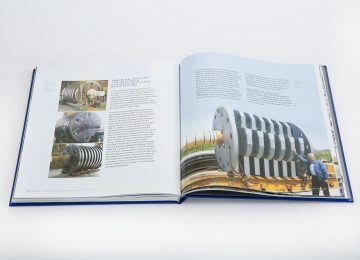 When they approached us with the request to create a corporate history book, legacy book, and company anniversary book for their 40th anniversary, Founder and current Chairman Thomas Wendt was ready to record his entrepreneurial legacy and the many contributions made by the first generation of Wendt employees. The Wendt’s were looking for a compelling narrative which, together with hundreds of photos and artefacts, would document the evolution of the company and its products over the course of 40 years. The HBS team researched and documented material from the company’s archives. We then conducted extensive interviews with founder Thomas Wendt and second generation president Tom Wendt Jr., long-time employees, and business partners. 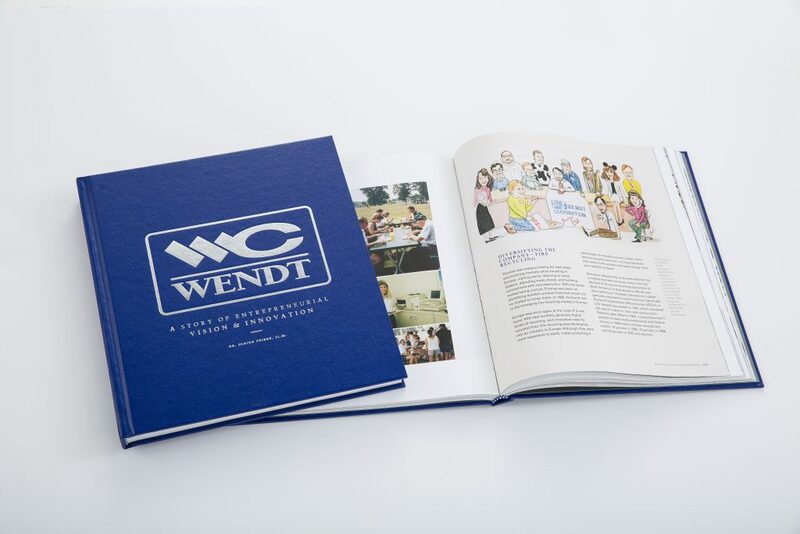 Early into that process, we realized that the authentic story of Wendt Corporation was as much about creating a distinctive brand as it was about building a family business that stood out through innovation and cutting-edge product and process design. 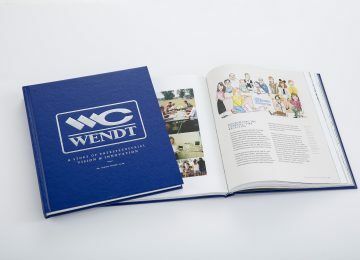 To create a premium coffee table book that conveyed the distinction of the Wendt brand visually as well, the HBS design team worked closely with the Wendt marketing department. The outcome is a 200 page hardcover coffee table corporate history book, legacy book, and company anniversary book authored by HBS founder and company history writer Dr. Ulrich Frisse that tells the story of Wendt Corporation in the larger context of manufacturing in the “Rust Belt” of the Northern U.S., partnerships between North American and European equipment manufacturers and the ever-changing character of the metal recycling equipment industry as a supplier to a commodity market deeply impacted by supply and demand at a global scale. 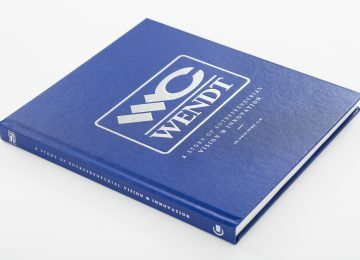 The distinctiveness of the Wendt brand is reflected in the book’s high-impact cover design that is dominated by the Wendt logo in silver foil on a skivertex cover wrap in Wendt blue, the company’s main brand colour. 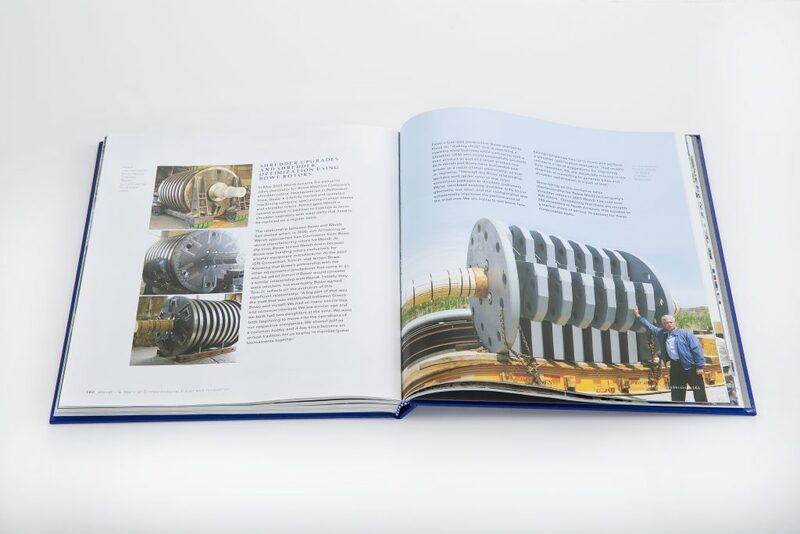 Throughout the book, Wendt blue and the company’s complementary brand colours are used strategically for visual consistency and continuous impact.